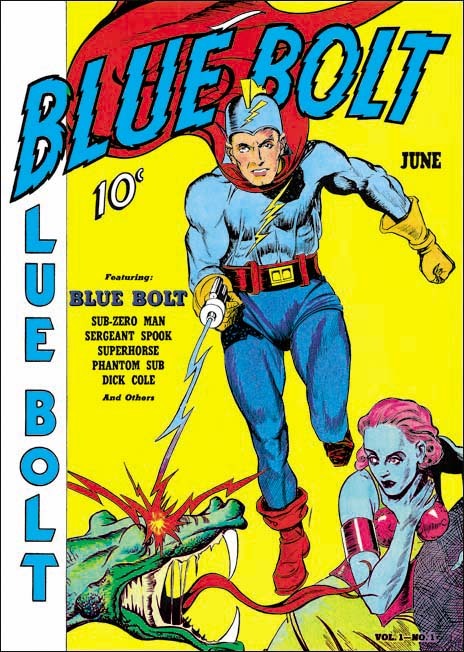 As previously discussed, Joe Simon’s creation of the feature Blue Bolt occurred somewhat earlier than the cover date of Blue Bolt #1 would suggest. Joe supplied it to Funnies Inc. a shop run by Lloyd Jacquet that put together comic books for other publishers. Blue Bolt was just one of a number of features that Simon created for the shop. 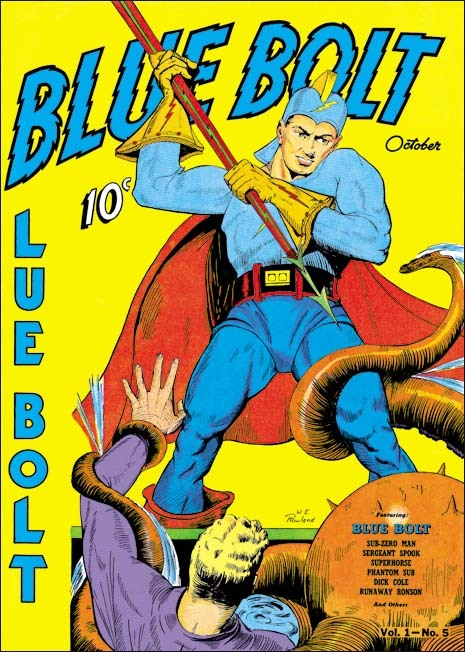 But apparently Jacquet and Novelty Press must have seen some special potential in Blue Bolt and used it as the title feature for a new comic book. Had that had been the intention all along it would be expected that Simon would do the cover art but since that was not the case we cannot assume he drew the cover. There are reasons to believe that Simon was not the cover artist and little to suggest he was. To my knowledge only the eyes of the Green Sorceress look like they might have been done by Simon. However many comic book artists found difficulty in getting eyes to sit properly on a face viewed from an angle. Otherwise none of the figures look like any other art that we can more confidently attribute to Joe. The Green Sorceress’ hair seems tamed in comparison to Simon’s depiction in the story. The dragon does not resemble the monsters in the story either. Blue Bolt’s cape lacks the distinct zigzag contour found in the story although Simon would abandon this device in future issues. Blue Bolt’s helmet includes a lightning bolt emblem that is missing from the story art. The gloves and boots have a three dimensional presence that Simon generally avoided and specifically did not use for Blue Bolt. Finally the composition is very untypical of Simon particularly the lack of any background elements causing Blue Bolt to float. It is hard to escape the conclusion that despite what some have claimed the cover art for Blue Bolt #1 was not done by Joe Simon. Jacquet’s shop had a number of comic book artist which could have been called upon to draw the cover. Perhaps the most famous were Carl Burgos and Bill Everett but I think it can safely be said that the style of the cover art does not match either of these two artists. Fortunately the next Blue Bolt cover was signed so there can be no question that it was drawn by William E. Rowland. The cover art for BB #2 shares some features with that for BB #1. In particular the more three dimensional aspects of the gloves and boots as well as the lightning bolt design on the helmet. I feel that the Blue Bolt’s face looks similar in the two covers. However Rowland goes even further in giving the gloves and boots a real physical presence. Further he has added details to the gloves that were missing from the BB #1 cover such as the lightning bolt and small circular shapes and lines that border the opening of the glove. While I would not rule out that Rowland was the cover artist for BB #1, I do not find the similarities strong enough to convince me that he was. The signature on the cover of BB #2 is particularly valuable because I doubt that Rowland would otherwise have been credited for the art. Apparently Rowland only worked on comic books for a few years (1939 to 1942) and even during that period he did not seem to do a lot of work. 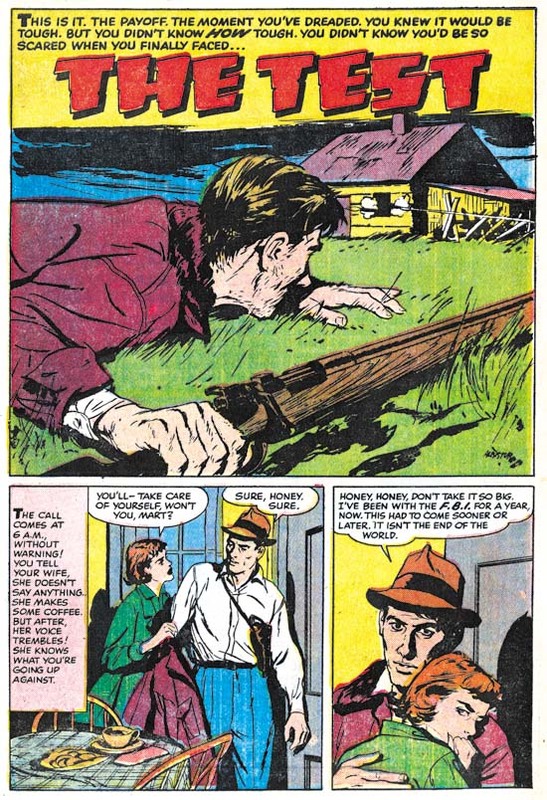 I have discussed one story by Rowland from Prize Comics #7 (December 1940) previously (Ted O’Neil). Frankly it was a rather unfair comparison of his take on the feature with Simon and Kirby’s. 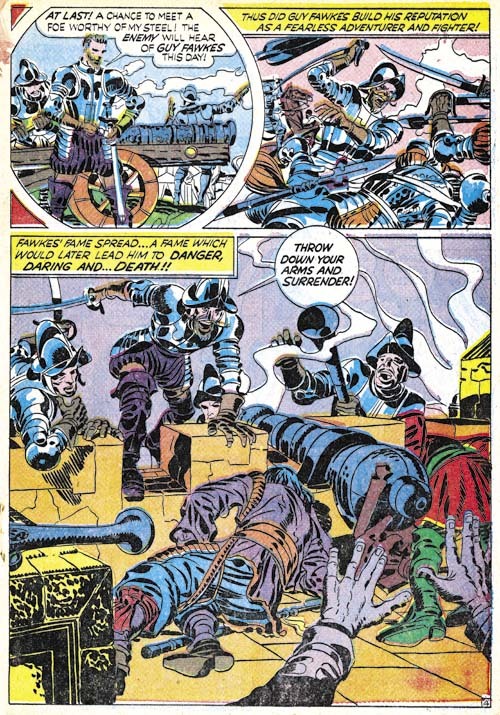 The purpose of the post was to highlight how radical Simon and Kirby’s work was compared to the work by more typical comic book artists even at this early stage in their career. Blue Bolt #1 also has a story drawn by Rowland and a scan of a page is provided above. Rowland is a good comic book artist, better than most contemporaries, but judging from the work I have seen so far it is hard to understand why he would have been selected to provide cover art. Whatever the basis for that decision it turned out to be a good one because Rowland’s cover art is rather nice and far superior to his story art. It was only with the third issue that Simon had his single chance to provide the cover art for Blue Bolt. Much could be said about the technical problems with the art. The cloth folds are a confusing mess and the perspective of the forward leg is not quite accurate. But these and others faults are nothing more than nick-picking that do not significantly distract from the cover’s impact. 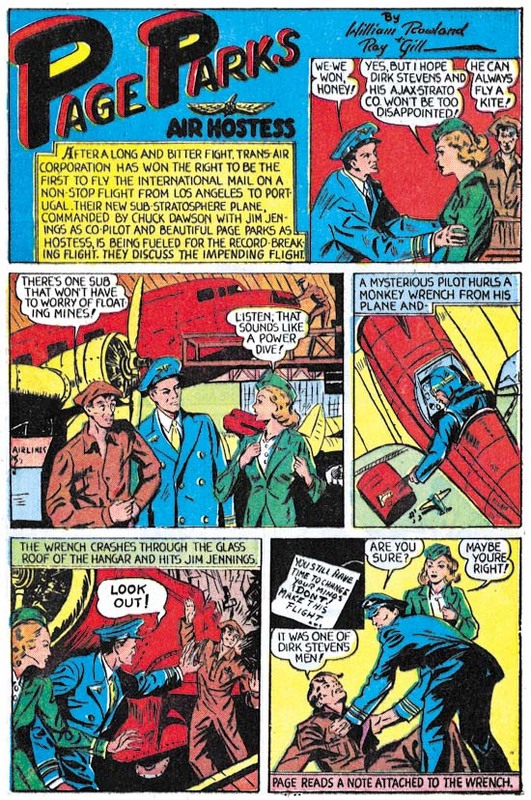 The figure of Blue Bolt was swiped from Alex Raymond’s Flash Gordon (see Art by Joe Simon, Chapter 4, Footnote) but Joe has infused the figure with excitement. Simon also uses a low viewing angle so that Blue Bolt can tower over his supporting soldiers. It is a effective depiction of an attaching force coming through some mountainous pass. There was a time that some attributed this cover art to Jack Kirby but nowadays there is general agreement that Simon drew the cover. Perhaps the most convincing evidence that Kirby did not draw the figure is the somewhat problematic nature of the perspective of Blue Bolt’s leg, Kirby’s use of perspective was always very convincing. While it is now known that Kirby did sometimes use swipes I have never seen an example of Jack swiping from the same source more than once. However this twice use of Raymond’s Flash Gordon running figure would not be unusual for Simon. 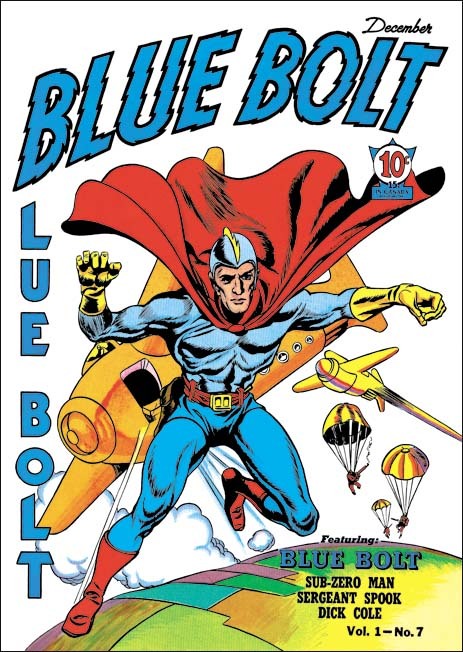 Blue Bolt did not appear on every cover of the comic that bore his name. 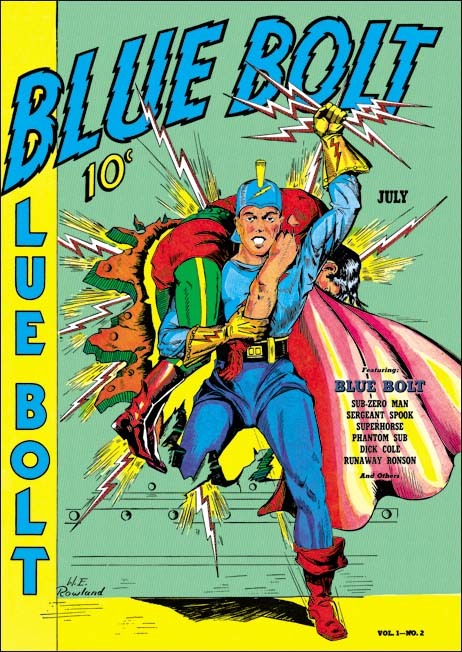 The next appearance of Blue Bolt was for issue #5 and once again Rowland has the honors. While this cover shares some stylistic features with the one Rowland did for BB #2 there have been important advances as well. Blue Bolt’s glove and boots have an even more exaggerated three dimensional look. The figures have become more massive and muscular and the inking finer and more detailed. While Rowland did a good job on the cover for BB #2, this one is a masterpiece. 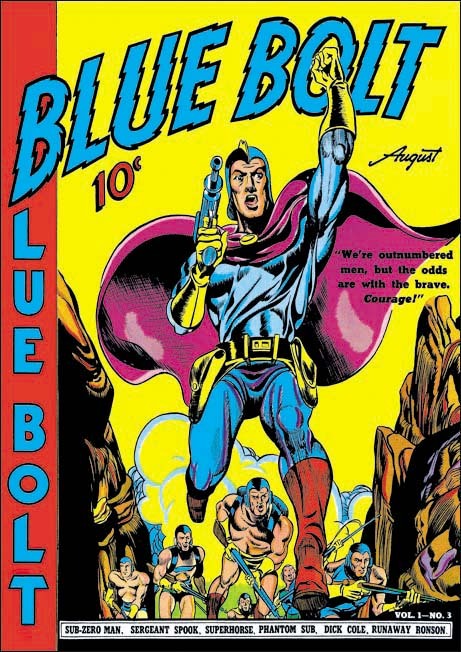 Issue #7 marked Blue Bolt’s final cover appearance during the Simon and Kirby run. It would be Jack Kirby’s only Blue Bolt cover. While not a bad cover it was not one of Jack’s finest either. I feel much of the blame comes from the action portrayed. Jumping out of a plane just does not have the impact of, for example, attempting to stop a bomb from exploding (as seen in the cover for Champion #10, August 1940). The rather unimpressive aircraft do not help either. I am not sure what they are meant to be since they lack propellers or jet engines. Rocket planes? 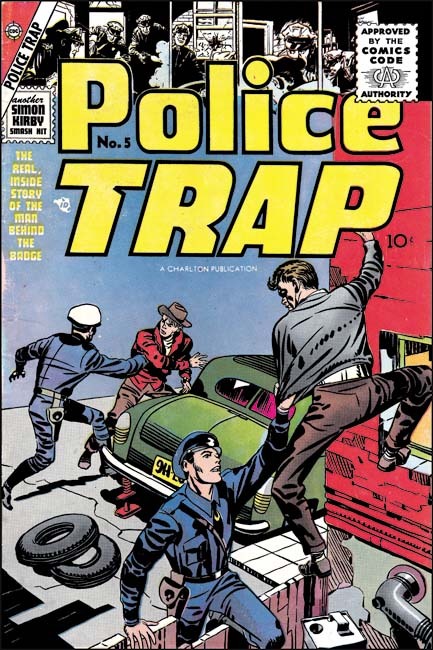 Police Trap #5 (July 1955) was the first issue published by Charlton. It appears to be composed largely of work that was already in the work at the time of the sudden failure of Simon and Kirby’s own publishing company, Mainline. It would expected most of that work would be used up and Police Trap #6 would consists of newly created work. All of the work on issue #6 was drawn by Jack Kirby. 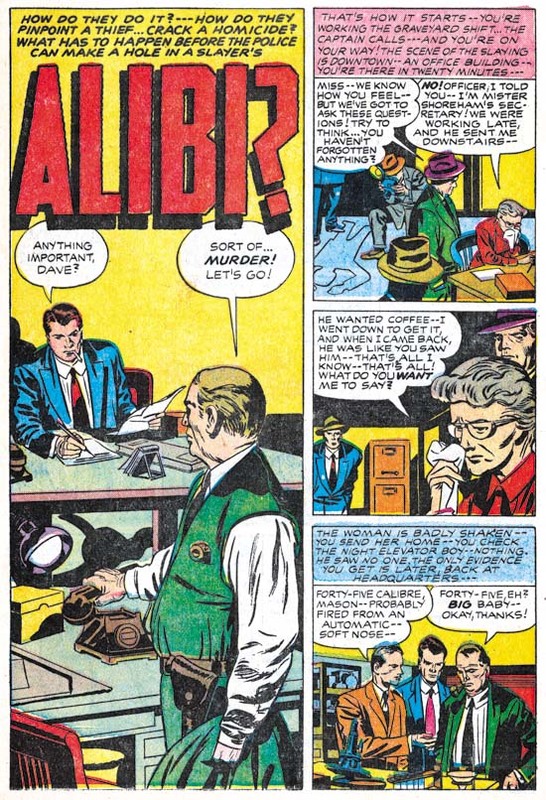 Previously Kirby’s involvement was largely limited to providing covers with the only Kirby story appearing in Police Trap #5. Jack’s greater presence can be explained as a means of offsetting recent financial loses. The cost of creating the Mainline comics was covered by Simon and Kirby to be paid back by a share of the profits. However with the sudden demise of Leader News Joe and Jack would not get the money to recover their publication costs. 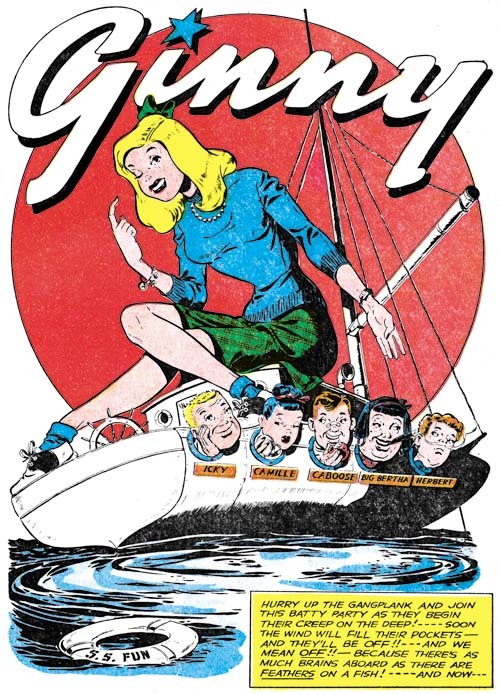 Their incomes from Prize Comics were based on a share of the profits but with all the negative public criticism against comic books those royalties were probably down as well. 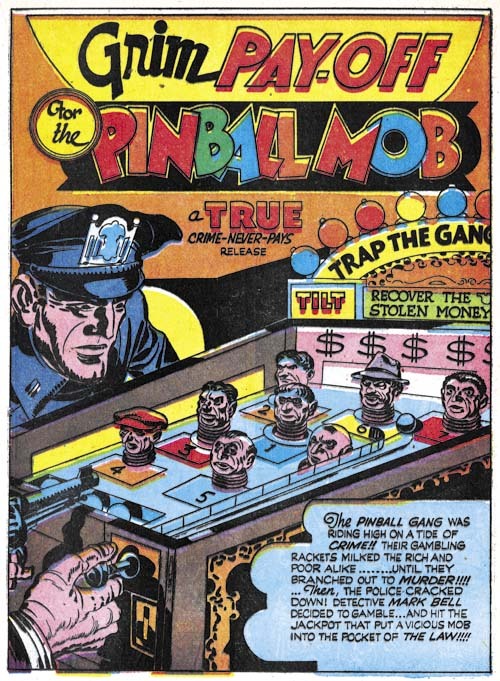 By providing all the art for Police Trap #6, Kirby probably hoped to decrease the production costs, increase sales (and therefore his share of the profits) but also be paid as the artist as well. the style used during the earlier period. 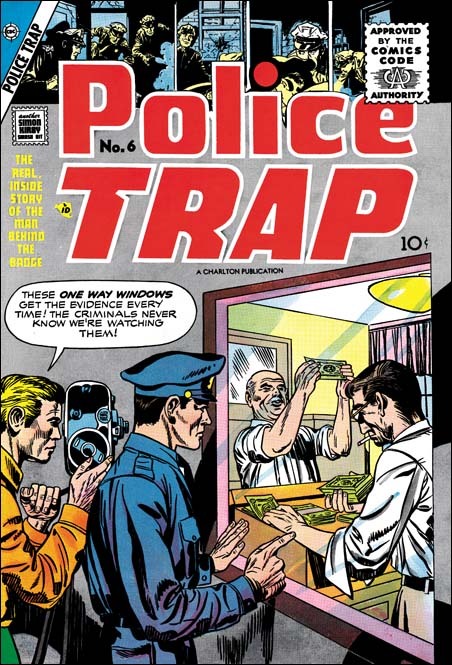 As mentioned above, Jack Kirby drew all the art for this issue which makes Police Trap #6 a special comic. Needless to say the art is all well done. Kirby had a flair for graphically telling a story. 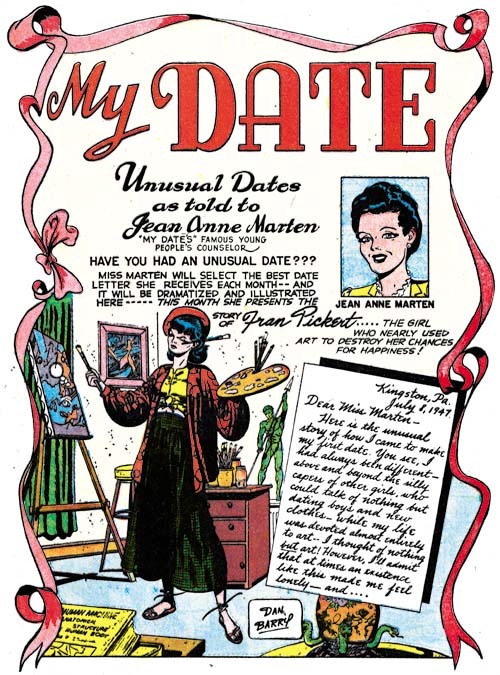 Note the short sequence of story panels at the bottom of the splash page. It starts out typically enough but then proceeds to two panels with captions or speech balloons. Text was not required to explain the story and in fact the lack of text makes the panels even more effective. Police Trap #6 is also special in that all the art was inked by the same artist. 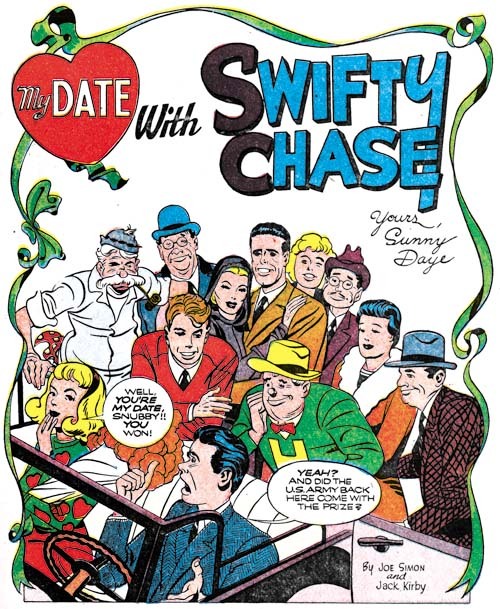 I’ll explain why I think this inker was Mort Meskin below where his hand is even more obvious but here I will discuss why I believe it was not either Simon or Kirby that did the inking. 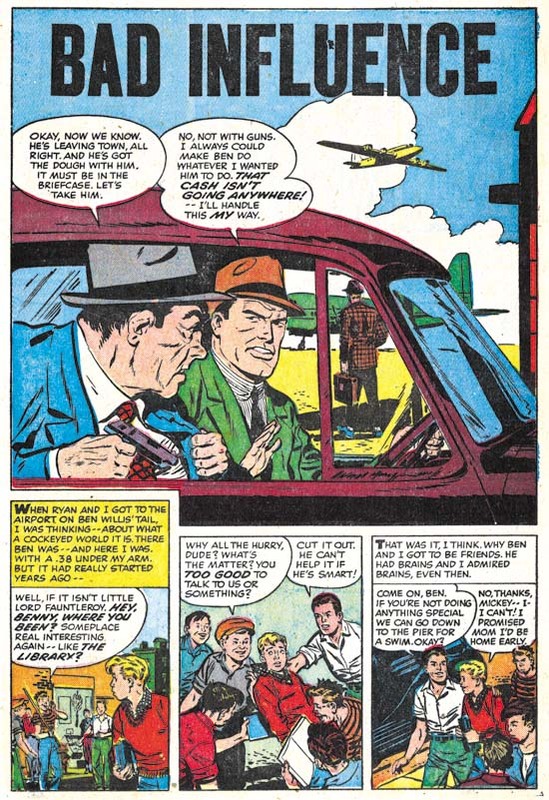 Normally that might not be too difficult to determine because both Jack and Joe were much better inkers than many of the other artists they used to ink Kirby’s pencils. Here, however, we have a great inking job. Not only that but it is done in what I describe as the Studio style. On this page (and others in this book) can be found shoulder blots, picket fence crosshatching and abstract arc shadows (see my Inking Glossary for an explanation of the terms I am using). 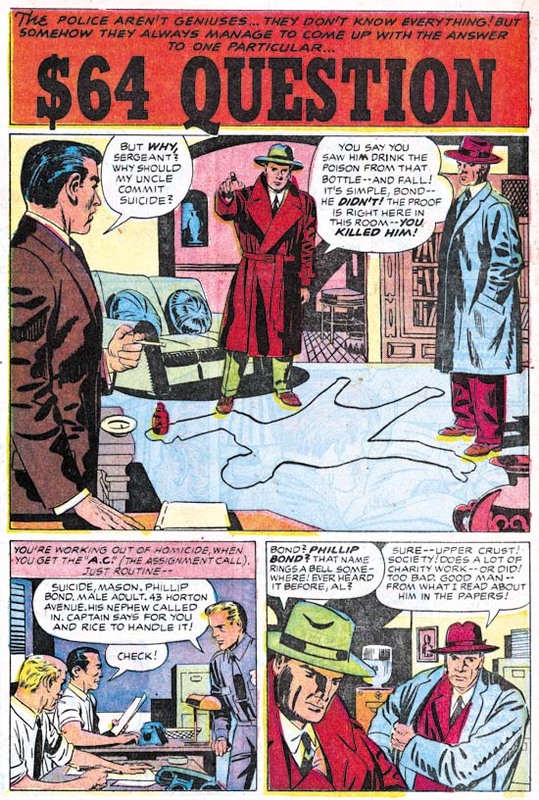 But note that the shoulder blots are not done in a manner typical for Simon and Kirby. They are less abstract and more apt to be broken up into pieces. The most glaring example of this is found in the man in the blue suite. There are other suggestions that this was not inked by either Simon or Kirby. Note the simple eyebrows even in the more close-up views provided in the splash panel. 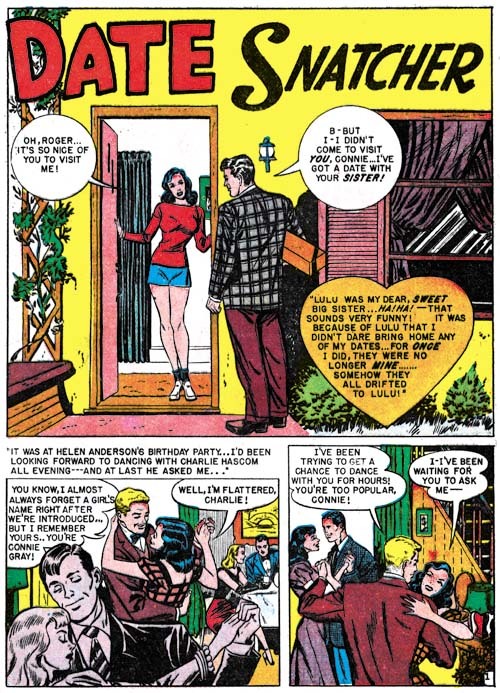 It is unclear whether some of the typical Studio style techniques were done by the inker or instead were added by either Kirby or Simon afterwards. For example the abstract arc shadow in the first story panel is done in a very typical style. My suspicion is that the original inker provided these touches as well as they are so well integrated with the surrounding artwork. If this is true it is another indication on how well acquainted the inker was with techniques previously used in the now defunct Simon and Kirby studio. 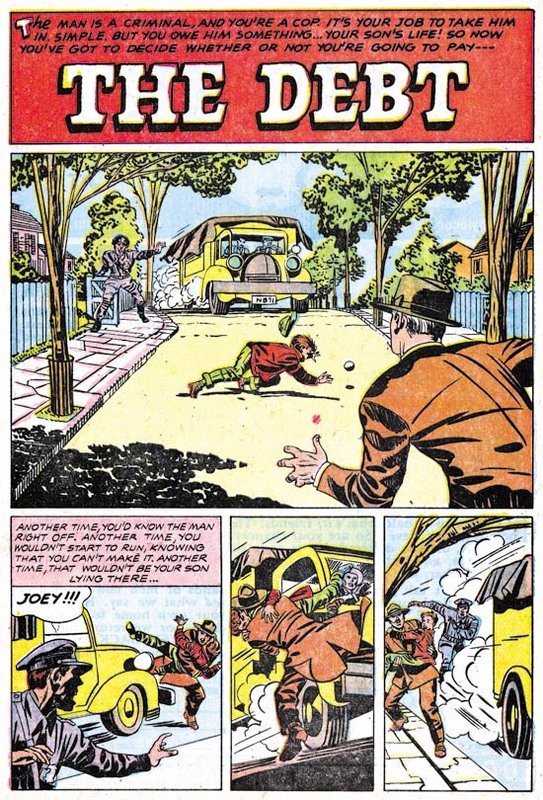 The story panels for the first page of “The Debt” follows the same pattern as seen in “The Amateur”. First an introduction panel that quickly places the reader into the action followed by two panels without text that show how the action unfolded. 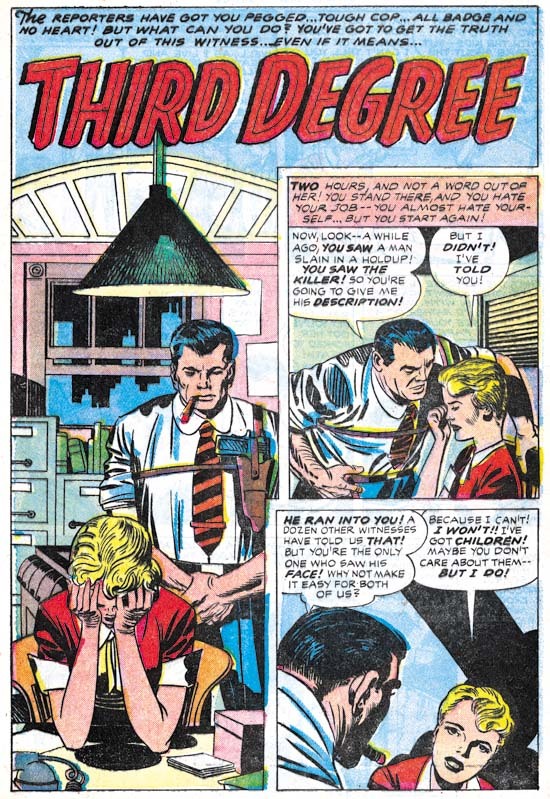 The big difference between the two stories is that while “The Amateur” has a typical splash the splash found in “The Debt” is actually a story panel as well. While collaborating with Simon, Kirby worked from scripts created by various writers but which he would then customarily rewrite. It is unclear how much of the published story was rewritten but there are often phrases that sound very much like Kirby. But who can say whether the original writer originated these unusual textless story sequences or that Kirby rewrote them into the script. The $64,000 Question was a popular game show in the 50’s and even today you occasionally here someone use that term a colloquialism for a significant question. However that show first appeared on television in June 1955 much too late to have influenced this story (whose creation start around February of that year). However there was an earlier game show that was on the radio from 1950 to 1952 that was actually called the $64 Question. Although it was off the air when this story was created I am sure that was that show that formed the genesis of this story’s title. All the stories in this issue were inked by the same artist. 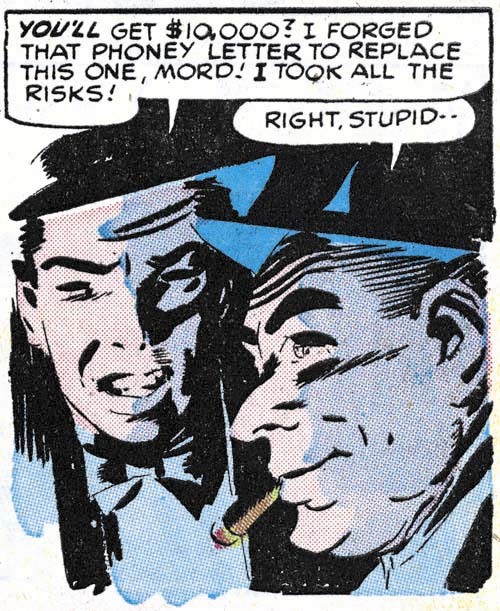 “Only The Guilty Run” is the story that most convincingly shows that this inker was Mort Meskin. Like all the other stories from this issue the inking was done in the Studio style. 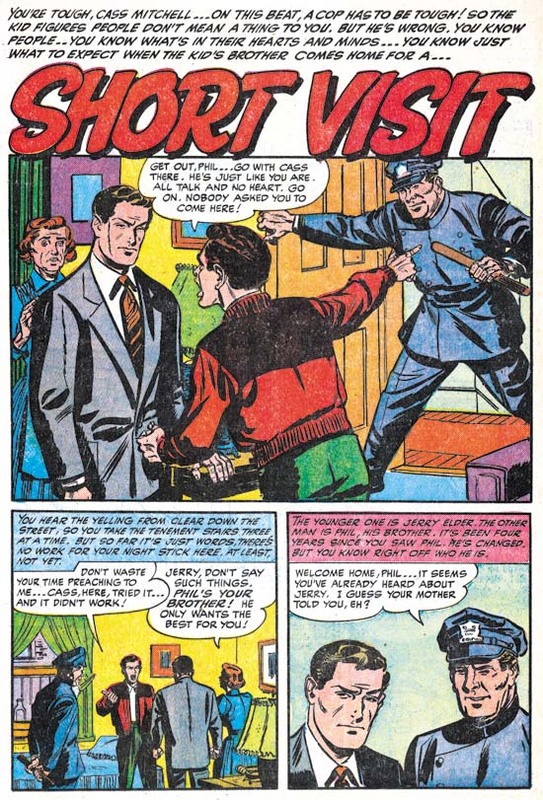 Most noticeable in the splash is his use of picket fence crosshatching. Of course other inkers used this technique most notably both Kirby and Simon. 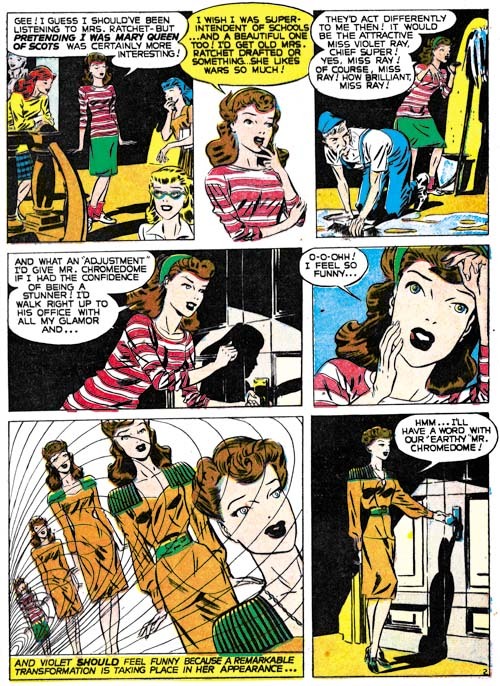 However Meskin executed picket fence crosshatching with an almost mechanical control compared to the more spontaneous use by Kirby or the more rougher brushwork by Simon. Observe how Meskin’s “rails” and “pickets” are almost consistent in width and the “rails” are placed to almost entirely contain the “pickets”. 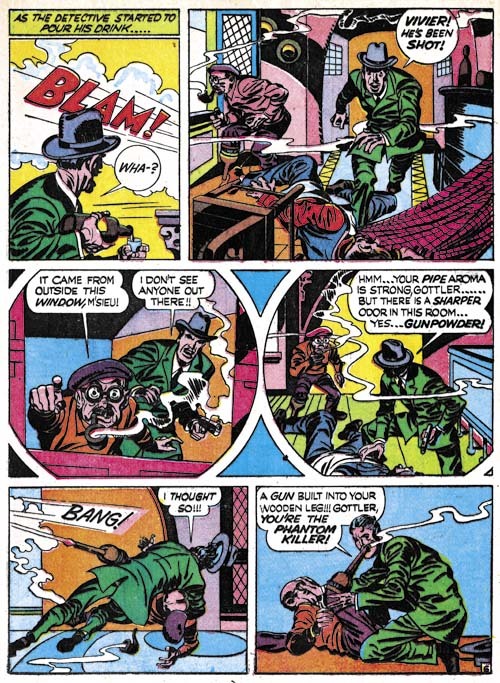 Other Meskin inking characteristics can be found in the simplified and often angular eyebrows particularly those of the escaping thief in the splash panel. Of course since credits were not provided inking attributions can never be given with absolute certainty but I am as confident as it is possible to be that this inking was by Mort Meskin. While the art may convince me that Meskin was inking there Kirby pencils I am somewhat puzzled how this came about. While Mort had inked Jack’s work before, generally he was too busy penciling and inking his own work. There were exceptions to this most notably in Boys’ Ranch (1950 to 1951) and Captain 3-D (1953). However in 1954 he had started working for DC. Meskin still did some work for Simon and Kirby but this was largely limited to some covers and nowhere near his prolific output when the S&K studio was going strong. Yet here he is providing a lot of inking for a single issue (plus one Kirby story for the previous issue). Very perplexing. Despite the Comic Code all the stories from this issue are really quite good but I have to admit that I find “Third Degree” the least satisfying. The interrogation of the housewife by the burly police officer seems a bit forced. Still that story and all the others in this issue leaves one with a desire for another all Kirby crime comic. 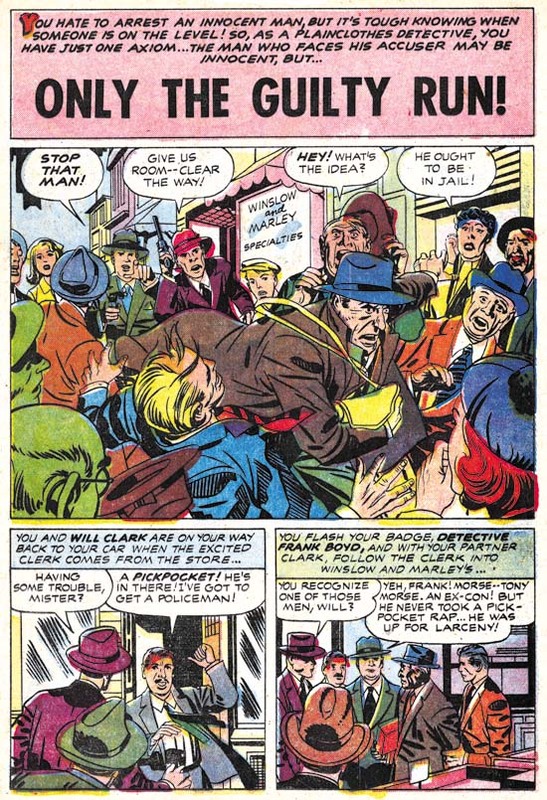 Unfortunately it was not to be, at least for some years (see Jack Kirby’s “In the Days of the Mob”) and never again with Joe Simon. I have had a comment about why I believe this inker was Mort Meskin and not Marvin Stein. 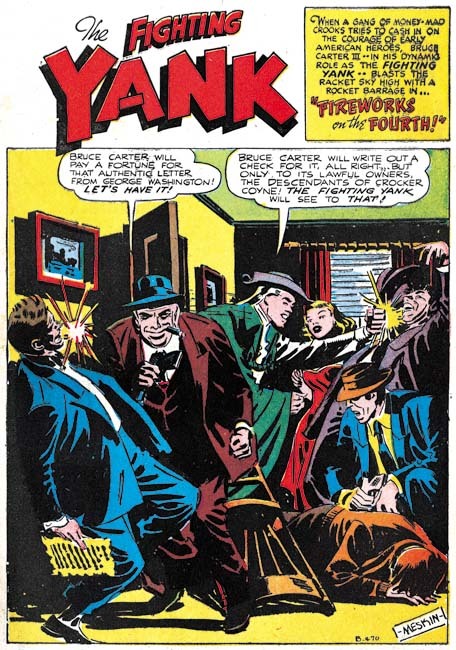 For readers who also wonder about this I suggest checking my previous posts Kirby Inkers, Mort Meskin and Kirby Inkers, Marvin Stein. “Thou shall not desecrate art”. Okay maybe Moses did not forget to include the eleventh commandment on his tablets when he came down from the mount. And I will admit that most of the other commandments concerned more serious sins. Still alteration of art is truly morally wrong. This restriction may seem odd when it comes to comic books since that art often gets modified on its way through the publication process. However a point is reached when comic art is published (or not) and further modification should no longer be done. Some will say that when a person buys a piece of art he can do anything he wants with it. But the truth is no one really buys art, it is more like an extended lease. While the person may have possession of a piece of art, the expectation should be that someday, somehow, it will pass on to someone else. It is the owner’s duty and self interest to preserve the art for that eventual day. James Steranko’s “History of Comics” is a great resource written by a man who is both a historian and practitioner of comic books. It was published in two tabloid size volumes and is long out of print. However issues appear at conventions and sources like eBay from time to time and are well worth the search. While profusely illustrated most of the images are small in size. There are a limited number of exceptions that take full advantage of the large dimensions of the books. 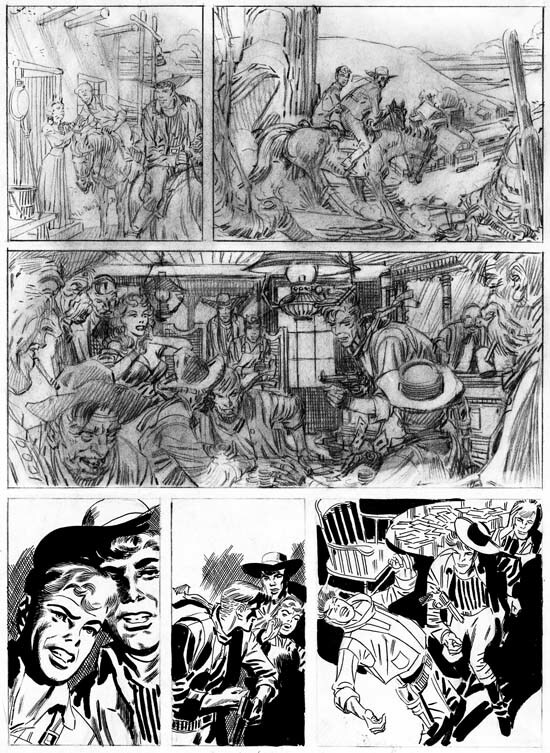 One of the larger illustrations in volume 1 is the source for the image shown above of a page done in pencil by Jerry Robinson and Mort Meskin. 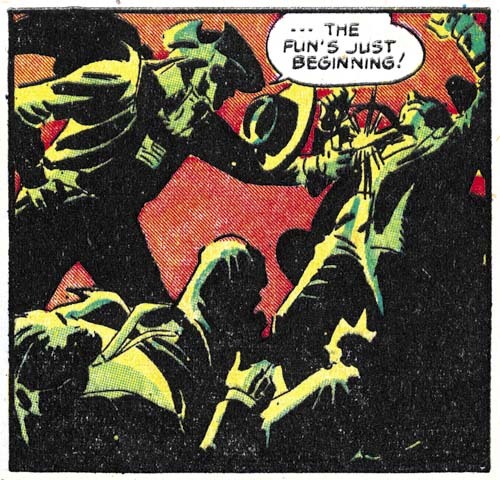 There are good reasons why Steranko gave this image such a prominent treatment. Both artists played important parts in the history of comics. Among the many contributions by Jerry Robinson is the work he did on Batman as a ghost artist for Bob Kane. Unfortunately Mort Meskin’s importance in the history of comics is largely forgotten today but is well understood by Steranko. Hopefully a forthcoming book on Meskin may help to change his current reputation. However Mort is not completely neglected for instance Ger Apeldoorn has provided some recent posts about some of his work (for example Tom Corbett Viewmaster, Real Crime and No Kid Stuff) and there is a list group devoted to him (Mort Meskin List). Besides Robinson and Meskin’s importance to the history there is the rarity of the art. Not a lot of original art for either artist has survived from early in their careers. While they shared a studio for some time they only collaborated for a relatively short period (less then two years) so examples of their joint work would be expected to be rarer still. Original art that was unpublished and left uninked are particularly rare. Last, but certainly not least of the reasons Steranko illustrated this particular page, is the quality of the art itself. What was this unfinished page originally intended? Meskin did some marvelous work on his creation, the Vigilante, which started as a hero feature and ended up as a western. 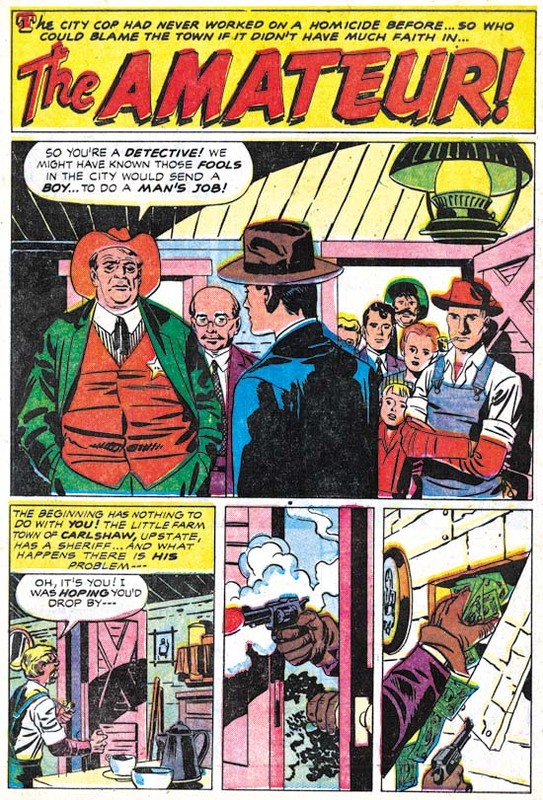 However Robinson was never associated with the Vigilante and the young man on this page of original art was clearly not the Vigilante’s sidekick Stuff the Chinatown Kid. 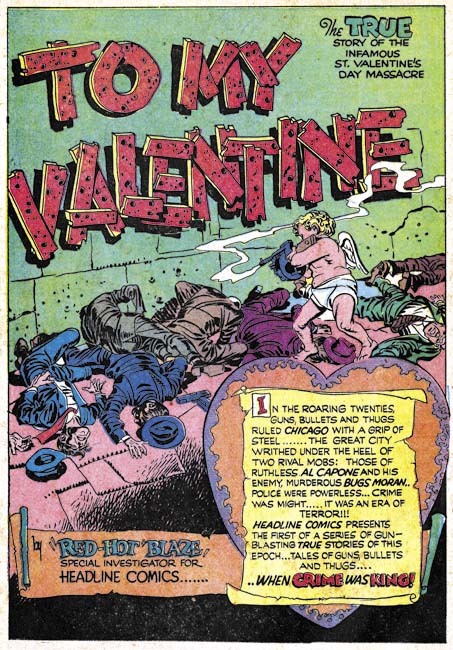 This page of art can also be found on the Meskin web site where it is suggested it might have originally have been meant for Prize Comics Western. The period that Robinson and Meskin are known to have collaborated was from January 1948 to August 1949 (cover dates). 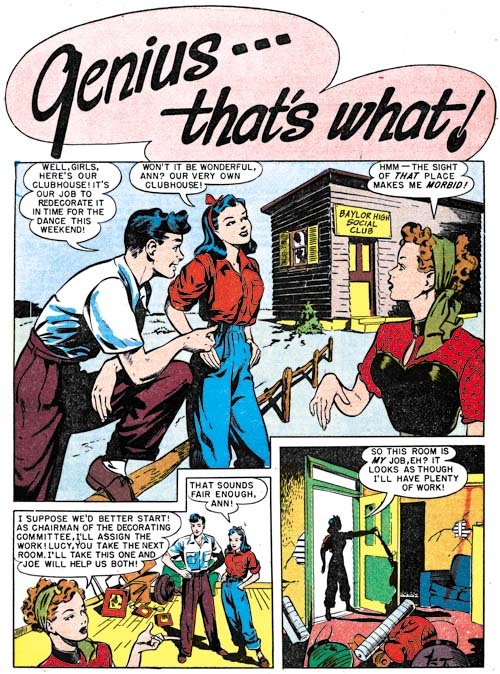 Prize Comics was converted to Prize Comics Western with the May 1948 issue so it certainly was a possible destination for this piece. 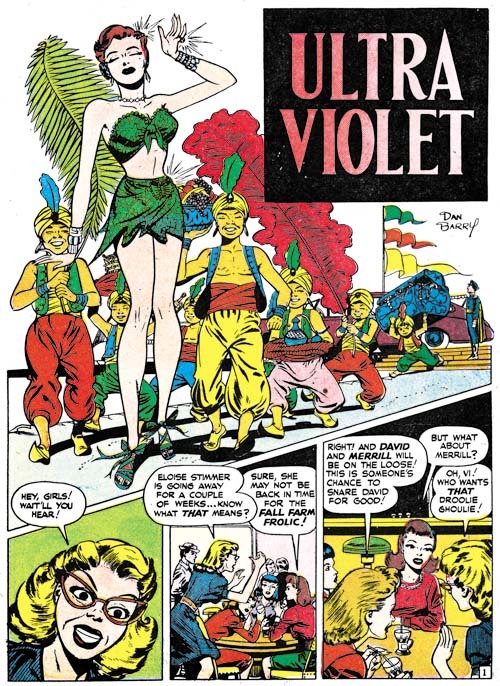 Robinson and Meskin were doing work for Simon and Kirby during this time and although I do not believe S&K produced Prize Comics Western they may have provided Jerry and Mort a connection to the editor of that title. But Robinson and Meskin’s work never be published in any issue of PCW and the solo Meskin would not appear in the title until 1956 1955. So while nothing rules out Prize Comics as the intended comic, there is little evidence to support that suggestion. Considering the artists, it is not surprising what a wonderful page this is. The third panel is particularly marvelous. This may be the most complex panel these artists had ever done either together or individually. The panel is framed on each side by the cutoff close-ups of two smokers. 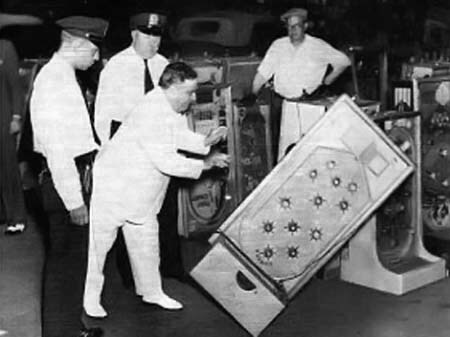 A gambling game gone wrong takes up most of the panel with onlookers filling the rest. Every little portion of the panel is filled with interesting details. The only problem is where would the speech balloons go? Actually this seems to be a difficulty with much of the page with only the second and fifth panels seeming to have room for the speech balloons. The fourth panel particularly seems to call for a balloon with no place to put it. This all suggests another possibility for this page, it may have been nothing more then a portfolio piece used to show perspective publishers what the artists were capable of doing. However in the end we are left with little more then informed speculation as to the intended purpose of this unpublished art. The image in Steranko’s book is just marvelous. Pencils are difficult to reproduce (which is why art is inked for comic book publication) but the image in “History of Comics” is clear and easy to see. Considering this was done before personal computers and scanners that was quite an accomplishment. Above is a more recent scan of the same art. 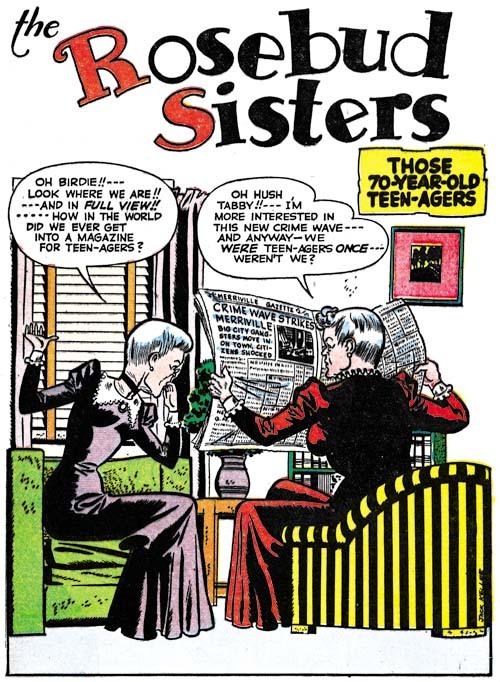 While it may not be as clear as the Steranko’s image it does show some subtleties that the published image did not. Even here the image has been enhanced as the original pencils are lighter. I had previously wondered what method Robinson and Meskin used when they collaborated on art since the final result looks like an amalgamation of their two styles. At least some of the inking appeared to have been done by Mort so the simplest explanation would be that Robinson did the pencils and Meskin the inking. But is the simplest explanation actually correct? The best way to answer this question is to examine uninked art such as the page discussed here. 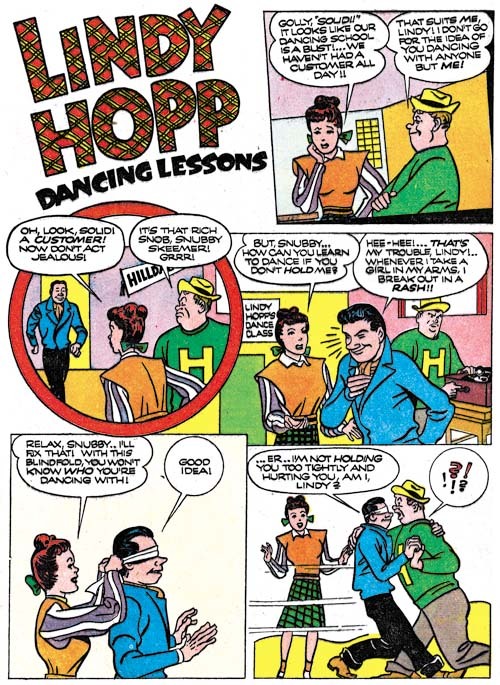 Most of the figures on the page look like they were done by Meskin with the exception of the woman in the third panel who looks like she was drawn by Robinson. That assessment is based on the style of the art but notice that the woman is drawn slightly darker then the rest of the figures. Remember this image is an enhanced scan and the difference is even harder to detect on the original art. The panel is so intricate and fully realized that I doubt that Meskin had simply left the woman blank for Jerry to fill in. To me this all suggests that Mort first penciled the entire page and then Jerry came in and altered portions. Robinson may have worked on parts of the art other then the woman but they are now hard to distinguish. I am not suggesting that this was the creation sequence that Robinson and Meskin used in all cases but it does suggest that the reason for their amalgamated style was the passing of the pencils from one artist to the other. It is interesting how fully developed the drawing is on this page. Not only are all outlines clearly indicated but the required spotting is shown as well. For example the shadows cast by the post sticking out of the top of the house in the first frame and the shadows on the underside of all the hats. Even the cloth folds have the sweeping parallel lines that are characteristic of Meskin’s inking. Previously I felt the inking of the Robinson and Meskin pieces had been done by Mort, but perhaps Jerry also did some inking that is now hard to detect because the inks closely followed the pencils. By now the reader maybe impatiently proclaiming “but what about the bottom row of panels”? What indeed. Because of the Steranko illustration we know that this row was originally uninked. Did Jerry Robinson, still very much active today, come back and resume working on the page? Or did Mort Meskin return to it before his untimely death? Unhappily neither is the case. 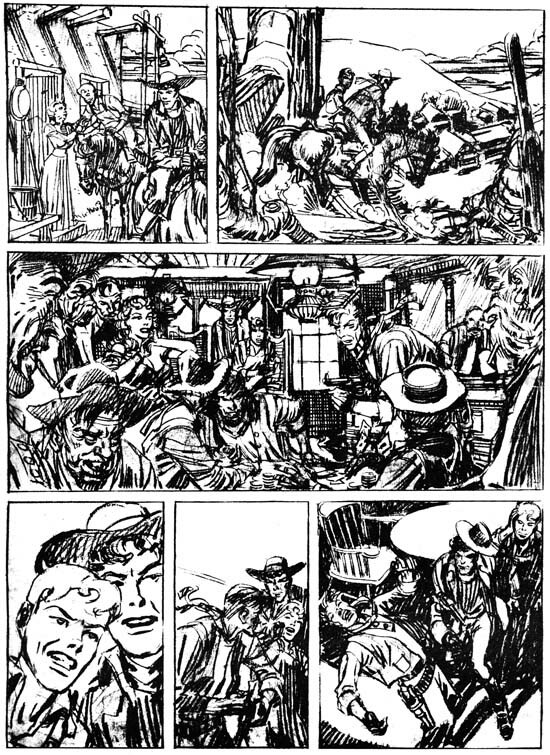 A good comparison between the inked version and the one found in the Steranko illustration shows many discrepancies. Hairlines were altered and cloth folds moved. Even the outlines were not closely followed. 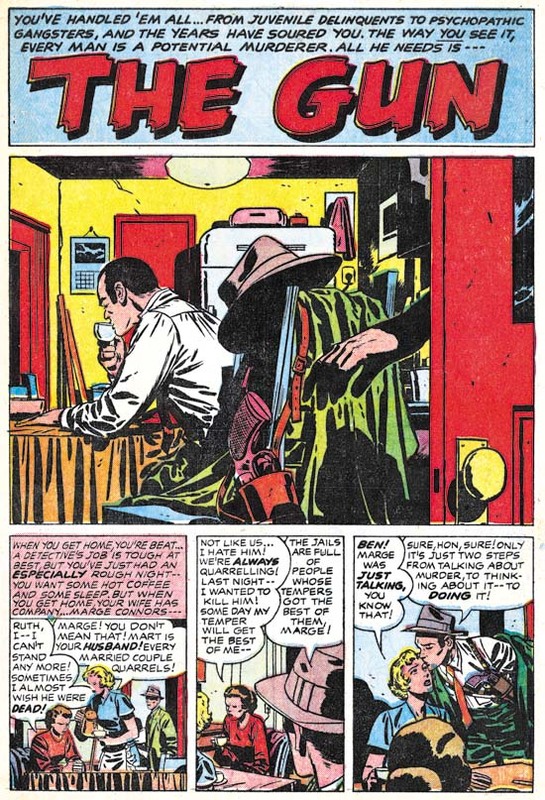 While it is not completely clear in Steranko’s illustration, the boy on the extreme right of the last panel is cast in shadow with just enough traces of light patches to indicate the shape of the figure. Apparently this was all beyond the questionable talents of the inker who covers it all in solid black. It is true that since the silver age of comics inkers are often expected to add their personal touches, but this particular inker’s alterations have done nothing but deaden the art. Since he did not follow the pencils closely one wonders why the inking was done directly on the original art and not over some copy? Once he had finished the bottom row the contrast between it and the two upper rows must have been painfully obvious even to this inker and he finally halted his destruction before any more damage was done and the page become worthless. The page is now a monument to the wisdom of the Eleventh Commandment. Frankly even if the inker had been more talented he should not have attempted inking the actual pencils. A modern inker has modern sensibilities and his art could not truly recreate the type of inking that would have been done on this page had Robinson and Meskin completed it.